I had my second Pain Managment appointment today and it went pretty well. I filled him in on how my back has been lately explaining how im struggling to manage because the pain seems to be getting worse and I’m struggling to sleep because the left side of my ribcage feels like its being crushed inwards however I lay. He again confirmed I suffer chronic pain which is hard to treat but we can try and find ways to manage it. I have to request an X-ray on my ribcage from my GP at my next appointment so he can see what is going on with it as you can visibly see the ribs poking out slightly too. I also let him know I have had my duloxetine upped from 20mg to 60mg because I’ve been feeling so depressed. He examined my back when we had finished covering everything and got me a Tens machine to use and showed me where to place it and how to use it. He told me didn’t want to refer me to physio yet until we see how things go after the steroid injections and using the Tens machine regulalrly. I now have to monitor my weight and weigh myself at the same time every week making sure it doesnt carry on dropping.. Not something I’m looking forward to as I try not to weigh myself too much due to past problems but I am getting so fed up of being in pain that I’m happy to gain some weight. I just really need to try and remember to eat more and make sure theres a few more snacks around as otherwise I forget and usually just eat dinner each day. Luckily the CatchMyPain app lets me add details and notes for each day so I’m going to make sure I keep track of everything on there so I can show the Dr next time as I totally forget half of what I need to say when I go in there! I wore the Tens whilst shopping after my appointment and it did seem a little easier although my balance is still awful and I feel silly walking. Hopefully the Tens helps me do more as I’m getting so fed up of not doing simple tasks or doing them then regretting it. I’ll be having my Steroid injections in just a few weeks and then wont see pain management until June 14th. I really hope by then I’ll be able to start physio again.. That is if I dont keep getting caught up in the wires of the tens haha! 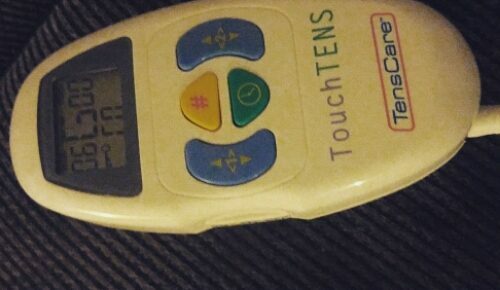 Have you used a Tens before? Did it help?